Annisquam Herb Farm: C. B. Fisk Inc. . . .
C. B. Fisk Inc. . . .
is holding an Open House June 12, 1020, 2-4 pm the their workshop, 21 Kondelin Road, Gloucester 01930. 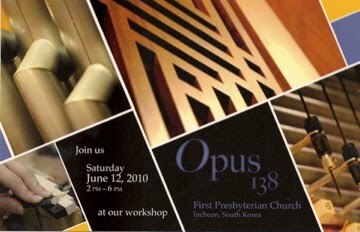 See and hear Opus 138, a two-manual, 28 stop organ for the First Presbyterian Church, Incheon, South Korea. If you have never been to the workshop you have a treat ahead of you! If you have been you know you know how interesting it is.